StreamStats is a Web-based geographic information system application that provides users with access to basin and streamflow characteristics for gaged and ungaged streams. Contacts: Michael S Kohn, P.E. The objective of this study is to provide a Web-based interactive tool (StreamStats) for determining streamflow statistics for any stream location within South Dakota for which applicable streamflow regression equations have been published. 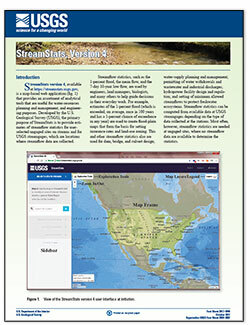 Interactively identify a watershed boundary and obtain detailed streamflow statistics. Click HERE for more. 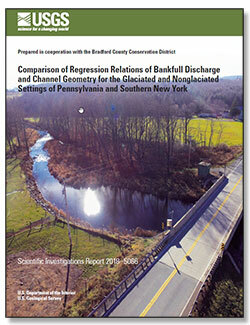 Clune, John W.; Chaplin, Jeffrey J.; White, Kirk E.
Clune, J.W., Chaplin, J.J., and White, K.E., 2018, Comparison of regression relations of bankfull discharge and channel geometry for the glaciated and nonglaciated settings of Pennsylvania and southern New York: U.S. Geological Survey Scientific Investigations Report 2018–5066, 20 p., https://doi.org/10.3133/sir20185066. England, John F.; Cohn, Timothy A.; Faber, Beth A.; Stedinger, Jery R.; Thomas, Wilbert O.; Veilleux, Andrea G.; Kiang, Julie E.; Mason, Robert R.
England, J.F., Jr., Cohn, T.A., Faber, B.A., Stedinger, J.R., Thomas, W.O., Jr., Veilleux, A.G., Kiang, J.E., and Mason, R.R., Jr., 2018, Guidelines for determining flood flow frequency—Bulletin 17C: U.S. Geological Survey Techniques and Methods, book 4, chap. B5, 148 p., https://doi.org/10.3133/tm4B5. 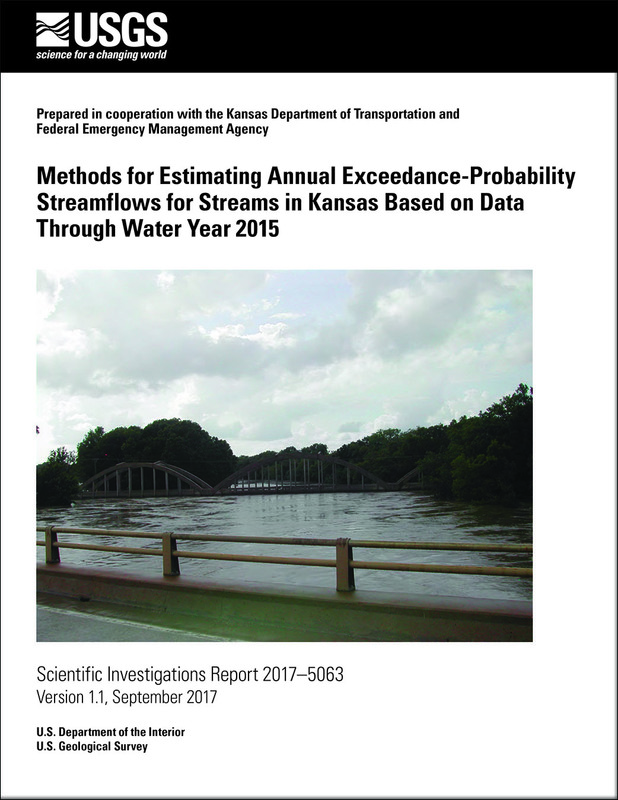 Painter, Colin C.; Heimann, David C.; Lanning-Rush, Jennifer L.
Painter, C.C., Heimann, D.C., and Lanning-Rush, J.L., 2017, Methods for estimating annual exceedance-probability streamflows for streams in Kansas based on data through water year 2015 (ver. 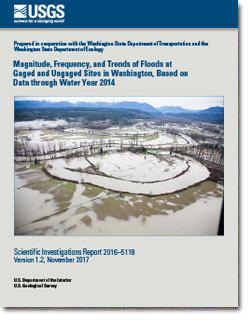 1.1, September 2017): U.S. Geological Survey Scientific Investigations Report 2017–5063, 20 p., https://doi.org/10.3133/sir20175063. 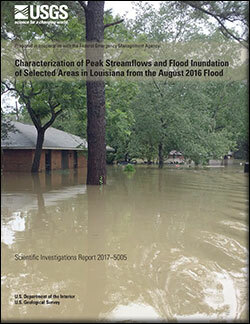 Watson, Kara M.; Storm, John B.; Breaker, Brian K.; Rose, Claire E.
Watson, K.M., Storm, J.B., Breaker, B.K., and Rose, C.E., 2017, Characterization of peak streamflows and flood inundation of selected areas in Louisiana from the August 2016 flood: U.S. Geological Survey Scientific Investigations Report 2017–5005, 26 p., https://doi.org/10.3133/sir20175005. 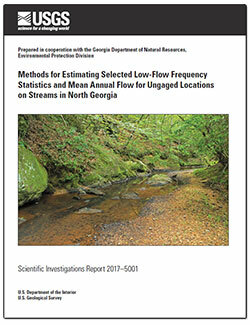 Gotvald, A.J., 2017, Methods for estimating selected low-flow frequency statistics and mean annual flow for ungaged locations on streams in North Georgia: U.S. Geological Survey Scientific Investigations Report 2017–5001, 25 p., https://doi.org/10.3133/sir20175001. 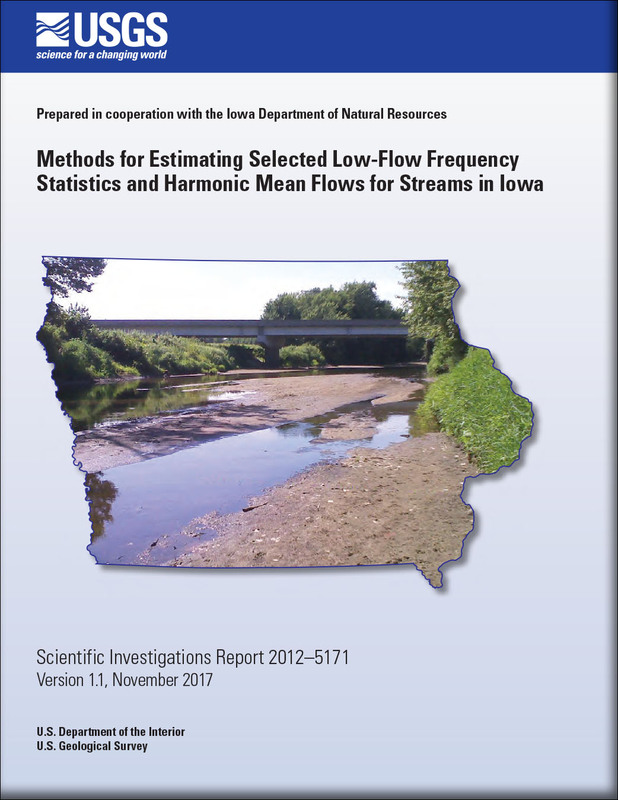 Eash, David A.; Barnes, Kimberlee K.
Eash, D.A., and Barnes, K.K., 2017, Methods for estimating selected low-flow frequency statistics and harmonic mean flows for streams in Iowa (ver 1.1, November 2017): U.S. Geological Survey Scientific Investigations Report 2012–5171, 99 p., https://doi.org/10.3133/sir20125171. 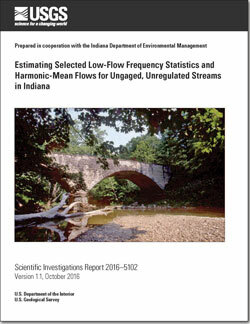 Martin, Gary R.; Fowler, Kathleen K.; Arihood, Leslie D.
Martin, G.R., Fowler, K.K., and Arihood, L.D., 2016, Estimating selected low-flow frequency statistics and harmonic-mean flows for ungaged, unregulated streams in Indiana (ver 1.1, October 2016): U.S. Geological Survey Scientific Investigations Report 2016–5102, 45 p., http://dx.doi.org/10.3133/sir20165102. Mastin, Mark C.; Konrad, Christopher P.; Veilleux, Andrea G.; Tecca, Alison E.
Mastin, M.C., Konrad, C.P., Veilleux, A.G., and Tecca, A.E., 2016, Magnitude, frequency, and trends of floods at gaged and ungaged sites in Washington, based on data through water year 2014 (ver 1.2, November 2017): U.S. Geological Survey Scientific Investigations Report 2016–5118, 70 p., http://dx.doi.org/10.3133/sir20165118. 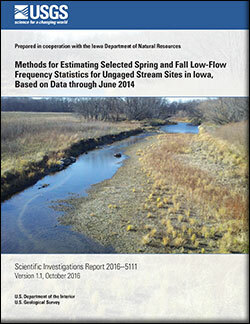 Eash, David A.; Barnes, Kimberlee K.; O'Shea, Padraic S.
Eash, D.A., Barnes, K.K., and O’Shea, P.S., 2016, Methods for estimating selected spring and fall low-flow frequency statistics for ungaged stream sites in Iowa, based on data through June 2014 (ver. 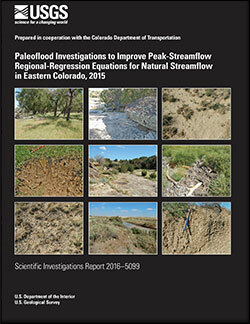 1.1, October 2016): U.S. Geological Survey Scientific Investigations Report 2016–5111, 32 p., http://dx.doi.org/10.3133/sir20165111. 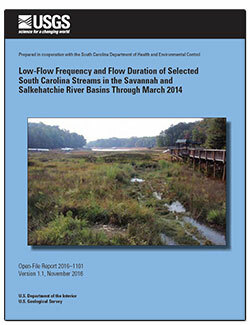 Feaster, T.D., and Guimaraes, W.B., 2016, Low-flow frequency and flow duration of selected South Carolina streams in the Savannah and Salkehatchie River Basins through March 2014 (ver. 1.1, November 2016): U.S. Geological Survey Open-File Report 2016–1101, 62 p., http://dx.doi.org/10.3133/ofr20161101. This tool produces shapefiles that contain the delineated basins, basin characteristics, and flow statistics for multiple sites requested at once by users. Before this tool can be used, the the points of interest will likely need to be edited in GIS so that they are coincident with the stream grid used by StreamStats for delineations and saved to a shapefile. The StreamStats application uses data web services that were created for it. When in use, the application manages interactions between the user and the services. However, the web services can be directly accessed using the StreamStats Service API documented here or consumed by a custom client application using HTTP protocols. 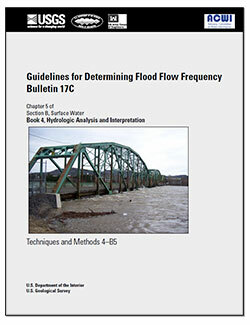 Helpful new information for anyone designing structures over or near water, managing water distribution, or interested in the flow of local streams. 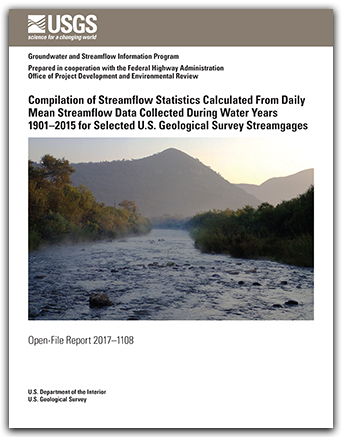 The StreamStats application provides an accurate and consistent process that allows users to easily obtain streamflow statistics, basin characteristics, and descriptive information for USGS data-collection sites and user-selected ungaged sites.